Is the US signaling new tolerance for corruption in Guatemala? Guatemala is descending into what looks to be its worst political crisis since 2015, when a corruption scandal engulfed former president Otto Perez Molina and forced his government to resign. U.S. policy during that crisis was critical to the ultimately favorable outcome. This time around, similar clarity and consistency in U.S. policy are vital to ensure that ongoing efforts to fight corruption and impunity in Guatemala continue to succeed. In the current crisis, President Jimmy Morales—who was elected in 2015 under the slogan “neither corrupt nor a thief”—is fighting accusations of corruption from the same United Nations–backed body that exposed his predecessor: the International Commission against Impunity in Guatemala. Known by its Spanish initials, CICIG was created in 2007 through an agreement between the United Nations and Guatemala’s government at the time. The unique arrangement—which exists nowhere else in the world—has brought international law enforcement experts to work side-by-side with the Guatemalan attorney general’s office to investigate criminal rings and public corruption. The resulting investigations have led to the imprisonment of murderers, narcotraffickers, money launderers and tax evaders and have implicated two other former presidents in addition to Perez Molina. Morales is desperately trying to avoid becoming the fourth, although it may be too late. CICIG revealed in 2016 that Morales’s son and brother had taken illegal payment from a government agency. Last year, Morales himself was shown by CICIG to have received some $1 million in unreported contributions for his 2015 presidential campaign. Although Morales denies the charges, the business leaders who made the donations have admitted their involvement and provided proof of their actions. Morales has avoided prosecution so far because the Guatemalan Congress has refused to strip him of his presidential immunity. On his borrowed time, he has been waging an all-out war on CICIG, accusing it of violating Guatemala’s sovereignty (an argument that resonates with Morales’s military backers and many Guatemalan conservatives) and twice calling for removal of its chief, Colombian prosecutor Ivan Velásquez. In late August, flanked by dozens of military and police officers, Morales declared he would not renew CICIG’s mandate when it expires in September 2019. A few days later, while Velásquez was traveling in Washington and New York, Morales announced that he would not be allowed back into Guatemala. Morales’s attacks on CICIG--which enjoys overwhelming popular approval—have not gone unchallenged. Pro-CICIG demonstrations have erupted in both Guatemala City and provincial localities. Two weeks ago, Morales was dealt a serious legal blow when Guatemala’s Constitutional Court ruled that he lacked the authority to ban Velásquez and that immigration authorities must allow the commissioner to return. Morales responded the next day by having his foreign minister send a tersely worded letter to UN Secretary-General Antonio Guterres demanding that he nominate a new commissioner to take Velásquez’s place. Morales’s next steps are not clear--although his determination to rid himself of CICIG certainly is: just this week, in his speech before the U.N. General Assembly, Morales renewed his complaints against Velásquez—many of them based on falsehoods or distorted facts—and insisted again that the commissioner be replaced with someone else. CICIG’s importance to Guatemala’s future is hard to overstate. Widespread corruption and crime have stymied the country’s economic growth, produced deep disillusionment in the general population, and fueled the flow of emigrants to the north. The specter of a civilian president who is increasingly beholden to the military harkens back to a darker era that few Guatemalans want to relive. Until now, the United States has been CICIG’s most important international backer, providing the bulk of its funding and, when necessary, pressuring successive Guatemalan governments to cooperate with its work. 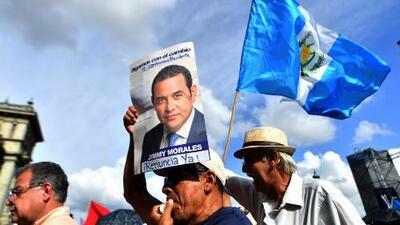 The question is whether that strong support will hold as Morales continues his attacks. Secretary of State Mike Pompeo told Morales in early September—according to the official State Department account—that the United States is committed to working with Guatemala to implement “reforms” of CICIG in the coming year. Analysts were left to wonder if that meant the United States was prepared to let Morales continue undermining CICIG—possibly as a reward for recent pro-Trump foreign policy moves by Guatemala that included relocating its embassy in Israel to Jerusalem. Fortunately, some U.S. legislators have expressed strong continuing support for CICIG. Senators Bob Corker and Bob Menendez and Representatives Ed Royce and Eliot Engel sent a letter to Secretary Pompeo reminding him that the State Department is required to certify that Guatemala is cooperating with CICIG and that, absent that certification, Congress can withhold half of U.S. aid that is part of a comprehensive policy aimed at promoting economic growth and greater citizen security. Some close observers believe that Morales is so desperate that the threat of losing foreign aid is no deterrent; he is ready to take the country with him if he falls. For many other Guatemalans, CICIG’s removal would be as painful as any cut in foreign aid. Guatemalans are fed up with corruption and remain fearful of organized crime. But CICIG has given them hope. Surely it is in U.S. interests to help CICIG meet Guatemalans’ expectations—not least to ensure that they have reasons to stay in their own country, working to build a well-functioning democracy that will be a stable, reliable neighbor and trading partner to the United States. The author is former ambassador of Guatemala to the United States, the United Nations, the Organization of American States, Canada, Germany and Norway.